I adore my wiggle dress from Unique Vintage. It reminds me of Joan from Mad Men. I love seeing Marilyn, Liz and all the other starlets in the '50s and '60s looking radiant and show stopping in these dresses. It made me think of my favorite muses over the years and their gorgeous styles. Whether you want to channel a slinky siren 1940's vibe or a groovy casual look from the 70's, I picked some of my favorite style inspirations from the '30s-70s. I also picked an outfit from Unique Vintage for each decade that will make you look like you stepped out of the pages of a vintage Vogue. This darling, detailed black tulle dress is vintage perfection. It offers elegant 1930's details, a tea-length high low hem and has an ethereal golden Hollywood vibe that will make you channel Carole or any of your favorite '30's starlets. The Luna dress from Unique Vintage is luminous and lovely. It's elegant and glamorous captures the 1940's perfectly from head to toe, from detail to detail. 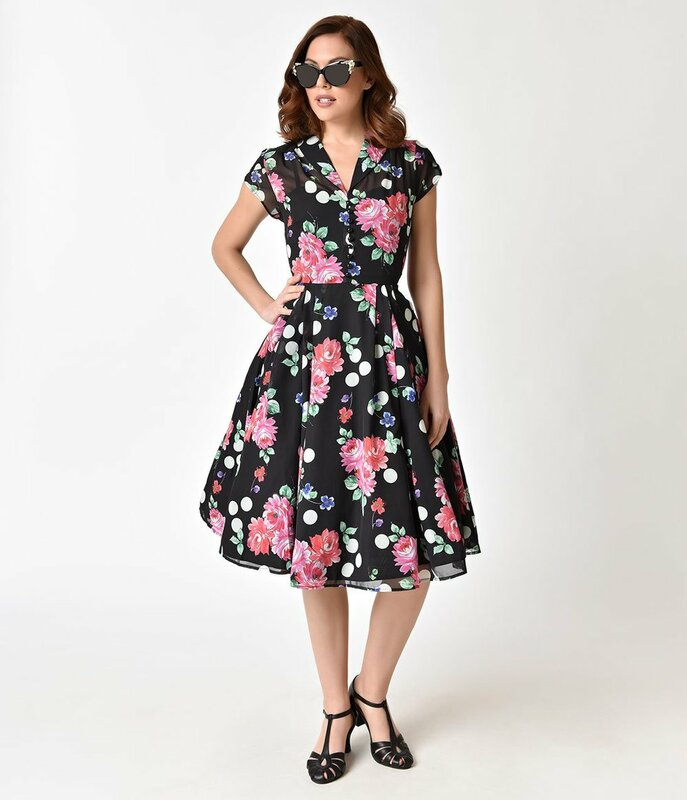 This gorgeous vibrant floral dress is perfectly 1950's. It has a vintage charm with a swing skirt and dainty cap sleeves. I can picture beautiful Dorothy in this fun, flirty frock. This floral flock inspired by the 60's is colorful and flirtatious yet boasts a modest neckline. It has the 60's sweetness and fun floral pattern. This 70's inspired stunner is meant to spellbound! This multi-colored stripped pattern is perfect to channel disco, psychedelic vibes.